Thank the basketball gods for Cleveland; they always make me feel better about the state of the Wolves. The All Star madness had just ended and the Wolves still had 30 odd games to play. They would be tough games. Very soon, I knew, we would all become completely twisted by our desire to reach the postseason. But there was no going back and no games to miss. I had already wasted most of the winter on this goddamn team. We all had. The time for turning back was in December when the Wolves blew games against Boston and Dallas. It was too late now. We would have to ride it out. We were, after all, professional members of Timberwolves twitter. Nikola Pekovic was injured. Kevin Martin was injured. JJ Barea was a god awful human being, with a carnage of dribble-dribble-shoot moments that had landed more than a few stout members of Timberwolves Twitter in the loony bin. Ricky Rubio, god bless his adorable heart, still shot the basketball like he was playing with the old timers at the YWCA downtown. Corey Brewer wasn’t even worth talking about. And Kevin Love. Well. If we were going to be perfectly honest about it, Kevin Love was the source of all of our collective fear and loathing. Suddenly, a terrible roar came from the coasts, where the national media vultures huddled in Bristol and Atlanta, desperate to break the news, whatever the news might be. Woj Bombs were dropping left and right. Chris Broussard was grinning into the camera like a demon from hell. Kevin Love was being shopped to Dallas, LA, even Golden State. For those who don't want to bother, low point was Simmons proposing "2-for-1" where Warriors trade Wolves Barnes and Lee for Love. Genius! And then the rumors began to bounce around the silicon walls of Twitter about the possibility of trades. According to SOURCES, Chase Budinger and JJ "The Scapegoat" Barea were being shopped to Memphis for Tony Allen and the Artist Formerly Known as Tayshaun Prince. According to SOURCES, Andre Miller wanted to come to Minnesota. According to SOURCES, we were all getting traded somewhere. Hell, sometime on Tuesday, rumors started flying that America’s sweetheart, Sandra Bullock, might be forced to play basketball for the Detroit Pistons. Seems a little unfair that Sandra Bullock is getting shipped around this much. I mean she was good in While You Were Sleeping Right? None of it made any sense and we all hated each other. We hated Flip Saunders. And we hate-loved Kevin Love. We hated ESPN for telling us what we already knew, hours ago. And we hated ourselves for caring so much about players, who really couldn’t care less about us. None of us really knew how to feel about Love, but we all wanted him to love us. 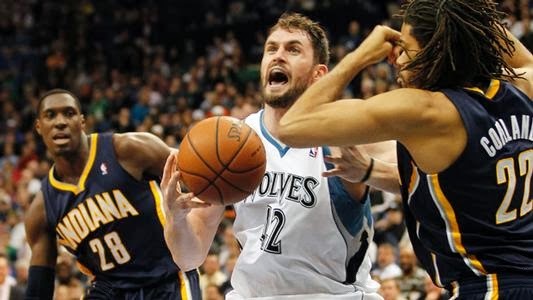 Somehow, sometime, on a cellphone screen in Minnesota, a feverish push was made to trade JJ Barea, no matter the cost. Others wanted to stay the course. To keep it simple. To trust in the team. And for hours, HOURS!, I couldn’t figure out how to turn off my damn caps lock. WHY ON EARTH WOULD WE WANT TONY ALLEN, COREY BREWER, AND LRMB ON THE SAME TEAM? (Flip, the goal is to get the ball IN the hoop). But none of it really mattered. No one was listening to us anyways. The Wolves had a game to play. Indiana was in town. A small market team with one superstar and several competent role players. A team we wanted to be. Just look at Indiana, we tweeted from the rooftops. JUST LOOK AT INDIANA!?!?!. WHY CANT WE BE LIKE THEM. Well, the Wolves were howling and the winter storm watch sirens were blowing. Kevin Love was flipping in 3-pointers like he was shooting ping pong balls into beer-laden plastic cups at a frat party. Ricky Rubio was flying across the court like a Spanish Unicorn. And we were all hopped up on caffeine and anxiety pills and trade deadline madness. Carpal tunnel syndrome was the least of anyone’s concerns. But god knows we all had it. And then something happened. The Wolves beat the Pacers. And we were jubilant. JUBILANT. For a moment, high fives and nice games and ‘gee those boys are neat’ was all the news. We were somewhere. We were doing something. The Wolves had won a big game. It was all happening. And then something else happened. Out from beneath a rock somewhere in the land of media asshats, Peter Vecsey surfaced to kill our collective buzz. For a moment, there was silence. And then we excoriated Mr. Vecsey. We called him an asshat and an ambulance chaser and the spawn of Skip Bayless and Satan. We begged, BEGGED, for someone to tell us wasn’t true. We begged for someone to tell us something, anything, to calm our collective fear and loathing about the state of basketball in the land of 10,000 frozen lakes. We begged someone to reassure us that Kevin Love wasn’t going to leave. He is our guy, we shouted. He is the guy who hands out coats to the coatless and signs autographs for hours and is a lean and mean rebounding machine and who said in a GQ article, “People think it's so far-fetched that I would stay in Minnesota. And I'm not shitting on the Lakers, but we have the better team, the better foundation. I'm having fun.” And eventually, on our couches and rugs, in our sleeping bags and on our beds, all across the great state of Minnesnowta we passed out, clutching our cellphones to our hearts, updating our Twitter feeds in our sleep, and dreaming of Spanish Unicorns and Love. When I woke up yesterday on Trade Deadline Day, I was still clutching my cell phone in my left hand. I checked my Twitter feed before my eyes were even completely open. A winter storm was moving in. 8-10 inches were headed this way. Followed by another polar vortex. Spencer Hawes had been traded to Cleveland and Steve Blake was headed to Golden State. For now, Kevin Love was still on the Timberwolves. And for now, fear and loathing was still very much alive and well in Minnesota.